The failure of the proposed Comcast-Time Warner Cable merger in April 2015 had many underlying causes, but certainly the substantial amount of public attention to the issue of net neutrality over the past two years contributed to it. How exactly net neutrality rose from a somewhat obscure and technical issue to one of mass attention stands as a compelling case study in new forms of digital communications — and the degree to which online actors may play a role in shaping public policy. The term “net neutrality” was first coined by Columbia University professor Tim Wu in a 2003 paper. In essence, it is the principle that broadband providers should not be able to create “fast and slow lanes” for Internet traffic based on consumers’ or websites’ willingness or ability to pay (or to block functional access to sites based on their content). Over the past decade, a huge volume of scholarship has been produced on net neutrality’s efficacy, its economic consequences and its potential downsides. New rules were proposed to protect net neutrality after an earlier legal challenge by Verizon struck down the Federal Communications Commission (FCC)’s 2010 Open Internet Order that embodied guidelines in place up to that point. Initial proposals by the FCC were met with a barrage of protest, as they included proposals that would allow broadband providers and content providers to negotiate deals to prioritize traffic. The FCC subsequently made the move to re-designate broadband services as “telecommunication services” rather than “information services,” allowing them to put in place much more robust regulations. The debate became even more politically charged when President Obama came out strongly in favor of this new approach. On April 1, 2015, the FCC sent the new net neutrality rules, first adopted in February, to the Federal Register for publication. This provides the groundwork for the next round in the ongoing battle over net-neutrality: Once the new rules are registered in the official record, lawyers for the telecommunications industry can begin to mount legal challenges against them. A 2015 study, “Score Another One for the Internet? The Role of the Networked Public Sphere in the U.S. Net Neutrality Policy Debate,” looks at the public debate on net neutrality in the United States as the FCC was rewriting its regulations from January to November 2014, when President Obama made his announcement. The authors utilized the pioneering analysis tool Media Cloud, a joint project between the Berkman Center for Internet and Society at Harvard University and the Center for Civic Media at MIT, to examine more than 16,000 stories published on the subject during that period. The researchers — Robert Faris, Hal Roberts, Bruce Etling, Dalia Othman and Yochai Benkler — also analyzed the connections between media sources formed by more than 10,000 links among the stories. Supplemented with analysis of Twitter trends and search volumes, the study investigates the role of different media sources and advocacy groups in influencing the terms of the debate and mobilizing action on net neutrality. 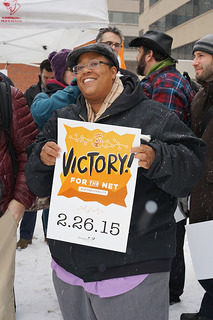 A diverse set of media sources played a prominent role in the net neutrality debate. This was assessed by tracking the number of “inlinks” that different stories and media sources received from within the 16,000 stories analyzed by the study, providing a measure of the popularity of different sources amongst those who write on the issue of net neutrality. Youtube received the most inlinks, with the most popular video being John Oliver’s June 1 show criticizing the FCC’s proposals for failing to protect net neutrality. A wide range of other sources also featured: from major national newspapers such as the Washington Post, the New York Times and the Wall Street Journal, to government websites for the FCC and the White House, to tech media organizations and net neutrality campaign organizations. Six of the nine key events that drove digital media coverage of net neutrality were driven by government action such as policy statements by the FCC or the President. Three of the events were related to activity by other actors: A blog post by the CEO of Netflix in March; John Oliver’s TV show in June; and social mobilization efforts by activists in September encouraging websites to display the “spinning wheel of death” to remind users of the frustration of slow load times and encourage them to contact lawmakers to demand action on net neutrality. The “link economy” within the stories analyzed gravitated primarily toward sources that either presented both sides of the debate or were in favor of net neutrality. Links through Twitter and bit.ly were even more overwhelmingly pro-net neutrality. By comparison, a qualitative assessment of coverage by traditional media found it to be generally down-the-middle, presenting arguments and citing sources from both sides of the argument. Arguments against net neutrality appeared few and far between, and when they were linked to, it was generally in the context of criticizing the author’s opinion. Related research: Harvard and MIT researchers have also used the Media Cloud tool to track the flow of stories, ideas and memes as they unfolded during the SOPA/PIPA legislative debate over digital copyright issues and the Trayvon Martin case. Joanna Penn is a graduate researcher at The Shorenstein Center on Media, Politics and Public Policy at Harvard University. This article was written for Journalist’s Resource, a project of the Shorenstein Center andthe Carnegie-Knight Initiative, and is republished under terms of a Creative Commons license. NextGlobal Climate Agreement in the Works?